Meeting with the mayor at Cambridge City Hall. Getting blown across the Harvard Bridge. Almost in Boston, our final destination. Interfaith prayer service, Blackstone Park. 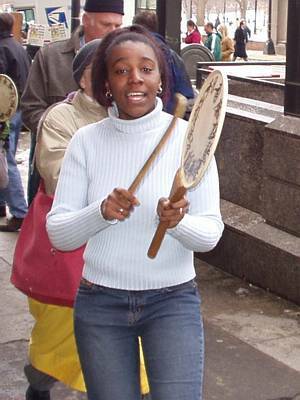 This young woman is a natural peace walker - she joined us spontaneously in Boston, and within minutes was drumming with enthusiasm. All good things must come to an end - final ceremony at Boston's City Hall. I'm back home, and now the walk is just a memory. The last day was cold and sometimes windy. 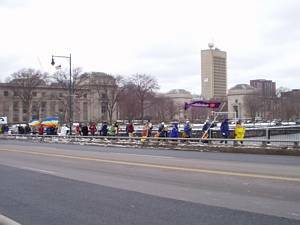 We walked from Harvard Square down Mass. 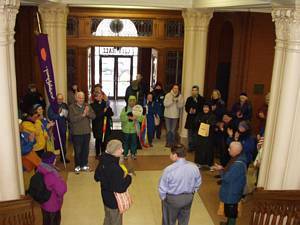 Ave., stopping at the Cambridge City Hall to meet with the mayor of Cambridge. Since Cambridge has already joined the Mayors for Peace campaign, we talked about the bio weapons laboratory development, and Cambridge's mayor was already well informed about the issue. Then we continued down Mass. 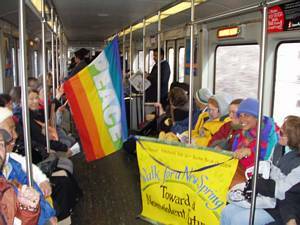 Ave. to Boston, where we made our way to Blackstone Park for an interfaith prayer service. We heard prayers from religious leaders, sang a few songs, heard from community activists about the proposed bio-weapons lab, then chanted together. After the prayer service, we headed to Boston's city hall, for a closing ceremony where we listened to 2 of Boston's city councilors speak to us. After walking and standing around in the cold, we were all ready to go inside to someplace warm once the ceremony was over. Many of us went across the street to a local bagle shop for a bite to eat and to say our goodbyes. The walk was over, but the connections made and the memories will remain. A snowy morning's walk out of Wakefield. Meeting with mayoral staff in Melrose. 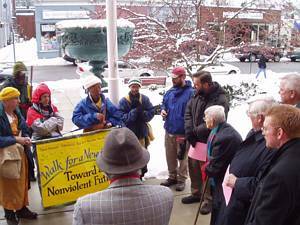 Walking through Medford Square with local peace activists. 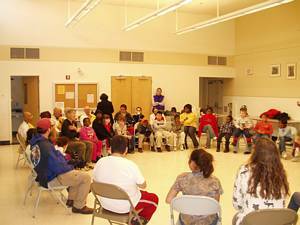 Visiting an after school program in Somerville. It was a busy day, with 4 gatherings of various types along the way. We stopped in Melrose to meet with local clergy, activists, and the mayor's staff, then went to a soup kitchen in Malden for lunch. After lunch we walked to a meeting with the mayor of Medford. 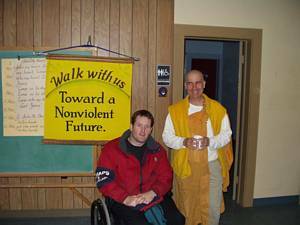 He had recently met the Dalai Lama, who was in Medford for a ceremony to dedicate a Tibetan temple there a few months ago. Medford also has a sister city in Japan, whose citizens helped rescue some sailors from Medford after a shipwreck off Japan long ago. The mayor was eloquent in his support for grassroots efforts like ours, and expressed his concern about the secretiveness of the proposed BU bio weapons lab. As we were walking out of Medford, there was a traffic accident, probably caused by a driver distracted by our procession. Fortunately no one was seriously injured, although one of the drivers, a young woman, was rather shaken up by it, and may have been hurt. A couple of us stayed with the drivers until the emergency vehicles arrived. The incident raised some questions about the effects of our walk, and our responsibility in causing this type of accident. It was uncomfortable to have this occur right next to our walk, and put a damper on the afternoon. Fortunately our next stop was at an after school program in Somerville. 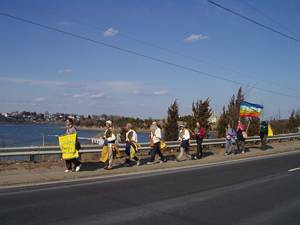 There we were greeted by a diverse group of youth, who were enthusiastic to hear our drumming as we arrived. We went inside and gathered in a circle, where we shared some of our walk experiences and answered the children's questions about our walk. Monique also asked the children about what peace means to them. Their simplicity and honesty were wonderful to hear, and helped us to think about peace in new ways. Lots of snow on the ground this morning, and light flurries continued throughout the day. 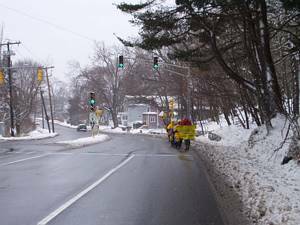 We were in no hurry to start the day, and shuttled from our morning meeting place to a coffee shop in the center of Waltham. From there we walked to Lexington center for lunch, and then on to Wakefield where we shuttled to Tina's place. Walking with so much snow is a challenge, and I think we were all damp and tired by the end of the day. Just where's your piece of pie? It just don't go around. If only you would sound. And doin so much more. If every bowl was full. With less spent on defense. Would you have butter on your toast? 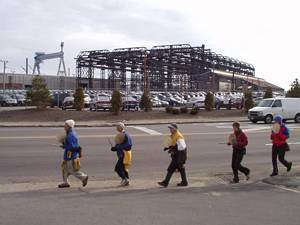 Walking for peace past the General Dynamics plant in Quincy. 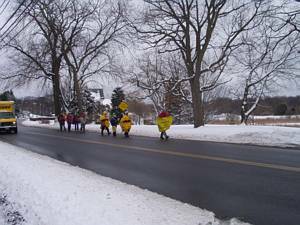 We walked from East Braintree to Quincy Center where we took the subway to Fields Corner in Dorcester. Walking through Dorcester and Roxbury, I got the sense that the wish for non-violence was more tangible to people's lives in these areas. Near Dudley station, I approached a group of men to give a walk pamphlet to one of them. One guy jumped up and thanked me for doing the walk. His son was recently killed by a stray bullet at Dudley Station, and he was still mourning his death. 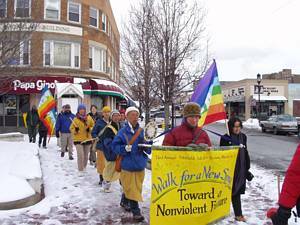 He told me about a planned walk in the Dudley Square area for April, and thanked me for walking for non-violence. 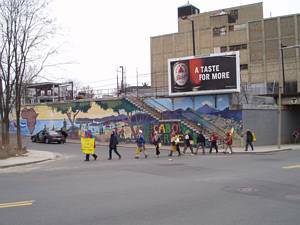 It would have been great to have a discussion about finding peace with a group from Dudley Square, I'm sure it would have added fresh perspectives to our walk and the issue of finding peace. Meeting with David Cohen, mayor of Newton, who gave us a warm reception. 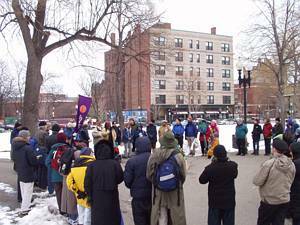 Then we walked to Albany Street and the proposed site of a bio weapons lab to be built on the BU medical center grounds. Activists are up in arms about this proposal, check out the Alternatives for Community and Environment web site for the reasons. After a wonderful lunch at Haley House in the South End, we bundled up, preparing for a late winter storm forecast for the area. 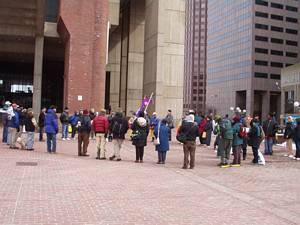 We walked through Kenmore Square, past BC, to the Newton City Hall. 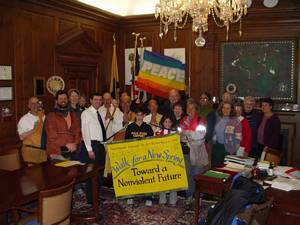 There we met the mayor of Newton, and engaged him in a dialog about nuclear war and the bio weapons lab proposal, while we presented him with a peace packet. After dinner we split up to go to our home stays. With around 6 inches of snow on the ground, I got my boots out of the van to prepare for today's walk. 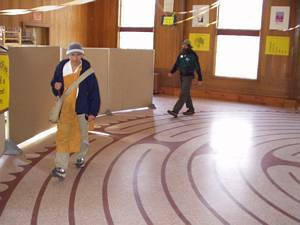 Brother Temm and Jim taking a different type of journey right after lunch. 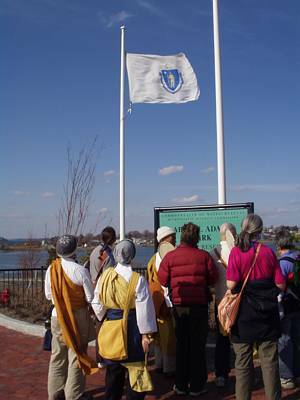 Kato Shonin leads a discussion on the Massachusetts state flag. 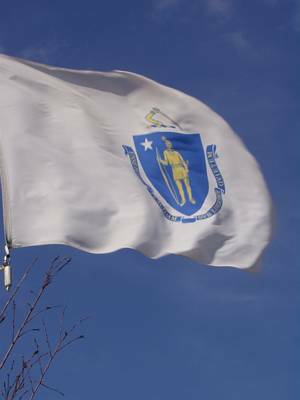 The flag is an arm holding a sword over a native American. It was a pleasant day to walk today. 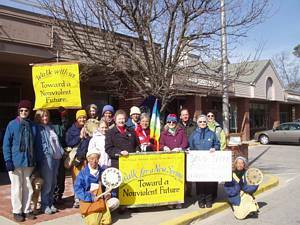 We walked through Scituate and Cohasset to lunch at the Unitarian Church in Hingham, where we were fed a wonderful meal by some friends met on last year's spring walk. Kato Shonin explained that it was more virtuous to receive a simple meal, but that didn't stop me from enjoying the excellent food. In the afternoon we walked through Weymouth to Braintree. When the lights behind his head light up, it's like you've hit the jackpot! I'm writing this in a Vietnamese temple in Braintree that used to be a nursing home. There is a central Buddha Hall surrounded by rooms. 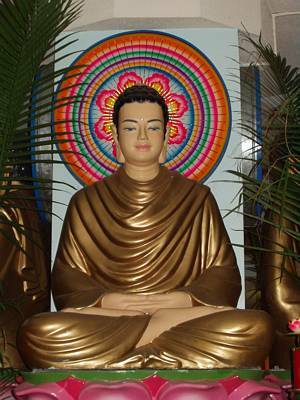 It would appear that the nurses station has been replaced by an altar with 4 Buddhas, complete with lights coming out from behind their heads. Nurses on duty replaced by meditating Buddhas - such is the evolution of this slice of America. From somewhere or another there's a deep gong that sounds about every 15 seconds - it sounds like a recording. The Buddhas on the altar are some of the youngest meditating Buddhas I've seen, and the lights coming from behind their heads - well, I guess there's no doubt that these Buddhas are enlightened. Posing with today's lunch bodhisatvas. After getting lots of sleep last night, today was a much better day. The gel shoe inserts I bought at lunch didn't hurt either. 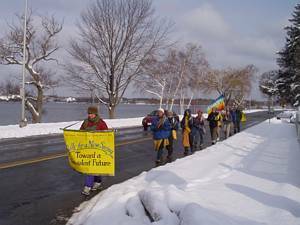 After a short stop in Plymouth to bless the statue of Massasoit, we went to Duxbury, where we met a local peace group that's been vigiling every week since before the Iraqi war. They made us sandwiches and other fixins for lunch, and told us about their activities. Brother Temm on the phone with the Faith Walk Reverend. 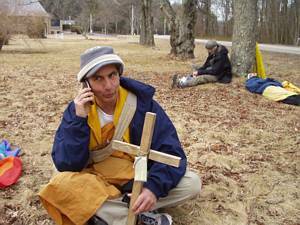 While walking through Marshfield, Jim found a couple of crosses next to the road. They were similar to one that Brother Temm found last fall in Connecticut. They had a tag explaining that they are placed in the ground every mile by a right leg amputee to spread the message of God's love, and to focus on our abilities and not our disabilities. Brother Temm called up the phone number listed on the message, and spoke to Reverend Carol Cruise about her faith walk, and to tell her a little about ours. An interesting connection made on the walk. Getting inspiration from wheelchair bound Wayne Ross. We arrived at the Harbor United Methodist Church in Scituate, and were met by Wayne Ross. Wayne and a friend set out a few years ago to ride their bikes from Northern Alaska to the southern tip of South America. Wayne ran into a bus in Guatemala and was paralyzed from the chest down. His friend completed the trip, which was done to raise awareness about MS. Wayne showed us a video of news clips about his trip, and we discussed our travels together. Wayne said that even though the news clips often focused on the bad events of the trip, he was amazed at the generosity and kindness received during his journey. Despite his accident, he continues to find new challenges and ways to keep involved in living a full life. For more entries, check the archives or recent entries.